Rice is a very popular item at Our Community Food Pantry, but we're currently running very low! Please consider donating rice to the pantry this week. Our clients can use rice in numerous dishes as it does not require extensive preparation. Rice is a great source of complex carbohydrates. In fact, the Food and Agriculture Organization of United Nations says that rice provides 20% of the world's dietary energy supply. Rice contains all the amino acids essential for building and maintaining muscle tissue. 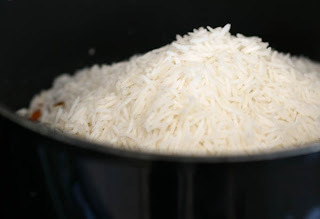 White rice is extremely soothing to the digestive system. Brown rice contains B-complex vitamins which help to nourish skin and blood vessels. You can find Long Grain White Rice on sale this week at Big Y. Grab 5 for $5 with your card!